Sand Swimmers: The Secret Life of Australia's Dead Heart is a non-fiction children's picture book, written and illustrated by Narelle Oliver, and published by Walker Books Australia (re-published 2013 as a Walker Classic, first published 1999 Lothian.) 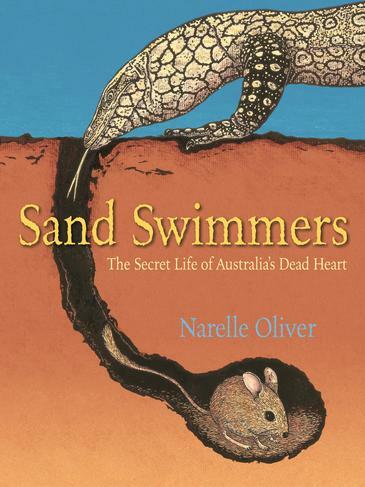 I would suggest Sand Swimmers is best shared with/read by kids 7+. The Dead Heart is a desert wilderness in the centre of Australia. It is difficult to imagine anything can exist in such a harsh place. But the Dead Heart has a secret. It holds amazing stories of adaptation and survival. Follow in the footsteps of early explorers like Charles Sturt and learn what the indigenous people of this land first discovered: not all is quite as it seems. Like most Australians, I live on Australia's coast. I know a little about inland Australia, but my main impression has always been that it's a vast, inhospitable, lifeless place. That's pretty much what the early European explorers decided too. Luckily, I have Sand Swimmers to set me straight. This is an elegant and fascinating book. The lino-cut and lino rubbing illustrations are superb and I love the way the individual prints "bleed" onto another page, or beyond the print boundaries. Oliver's use of a muted and limited palette contributes not only to the elegance, but also echoes the way harsh sun leeches colour from a landscape. The paradox between a common belief that Australia's heart is dead and the reality of adapted life forms is the "secret" kids will learn and appreciate. "There are huge waves, not of water, but of fiery red sand. There are lakes of glittering salt and rivers of cracking clay." "Did man ever see such a place? A kind of dread came over me as I gazed upon it." Sand Swimmers will fascinate young scientists. It's an excellent choice for school libraries - a great example of an information text, and a source of lovely descriptive language for when classes need description models. I like the way it shows us Australia's dead heart from the contrasting perspectives of indigenous tribal groups and explorers like Sturt. There are teacher notes available at the Walker Books website. Oliver's website has interesting background information on the book. Thank you for sharing this post with the June Carnival of Children's Literature. This sounds like a great book. Lovely to have you visit, Lizann!